The winner of the 68th Prix Louis-Delluc (Louis Delluc Prize) was announced at a ceremony on Friday at Hotel Fouquet's Barriere in Paris. 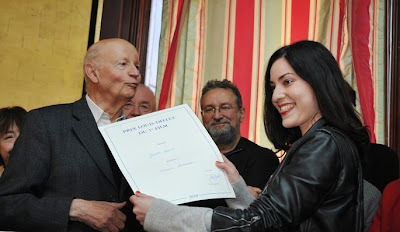 The prize went to Mystères de Lisbonne (Mysteries of Lisbon) by Franco-Chilean Raoul Ruiz. Mystères de Lisbonne had its world premiere at the 2010 Toronto International Film Festival. The the four-and-a half hour drama has been turned into a six-hour television miniseries. It beat the five-and-a-half hour drama/mini-series Carlos by Olivier Assayas. In addition to Carlos, the other nominees for the Louis Delluc prize were Des filles en noir (Girls in Black) by Jean-Paul Civeyrac, Des hommes et des dieux (Of Gods and Men) by Xavier Beauvois, La princesse de Montpensier (The Princess of Montpensier) by Bertrand Tavernier, The Ghost Writer by Roman Polanski, Tournée (On Tour) by Mathieu Amalric, and White Material by Claire Denis. The Prix Louis-Delluc du premier film was won by Belle Epine (Beautiful Thorn), a coming-of-age drama by Rebecca Zlotowski. Belle Epine stars the young actress Lea Seydoux who also appears in Mystères de Lisbonne. Des hommes et des dieux (Of Gods and Men) previously won the Grand Prix at the Cannes Film Festival and is France's official submission to the Academy Awards for Best Foreign Language Film. The Prix Louis-Delluc is awarded by a jury of critics award for best French film of the year. It is named after Louis Delluc, filmmaker and writer. Uploaded by baryla. - Full seasons and entire episodes online.